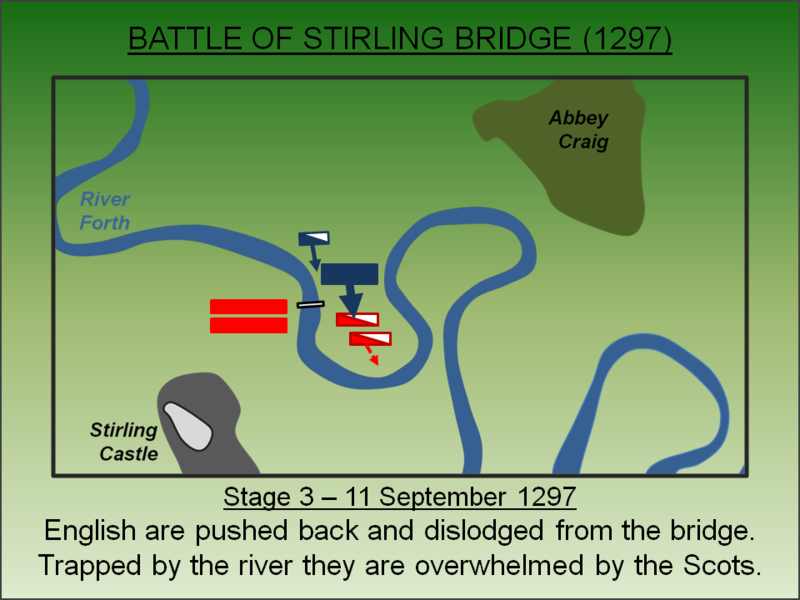 The first major defeat of the English in the Wars of Scottish Independence, the Battle of Stirling Bridge afforded Sir William Wallace the opportunity to prove his military credentials and obtain significant political power. His victory here led to almost all of Scotland briefly coming under his control. Alexander III died in 1286 leaving a 3 year old girl, Margret (the Maid of Norway), as his only heir. When she died in 1290, no less than 13 potential candidates sought the throne. To prevent anarchy, Edward I of England was asked to arbitrate on the Scottish succession. He used the opportunity to install himself as overlord of Scotland first taking control of all Royal castles and ultimately selecting John Balliol to be King of Scots - an individual whom he anticipated would be his vassal. However John proved less pliable than Edward had originally hoped. In 1295 he rebelled prompting an invasion; the English attacked Berwick-upon-Tweed and then defeated a Scottish army at the first Battle of Dunbar (1296). John sued for peace but in 1297, seeking to exploit English troubles in France, the Scots rebelled once again this time led by Sir William Wallace and Sir William Moray. English authority in the north of Scotland collapsed leaving just Dundee as a remote and isolated English outpost. With Edward I fighting in France, the English deployed a smaller army than might otherwise have been available under the command of the Governor - John de Warenne, Earl of Surrey. The English force marched north planning to travel via Stirling, to relieve the beleaguered English garrison. Stirling Castle was already in English hands, having been captured the previous year, and it overlooked a single narrow bridge over the River Forth. This was the main crossing point into northern Scotland (although a ford existed a further two miles upstream) but it presented a significant bottleneck to an advancing army. This was further compounded by the path of the River Forth which bends into a number of loops further limiting military deployments. Wallace had every intention of using these features to his advantage and, by the time Surrey arrived at Stirling, he was already in position. 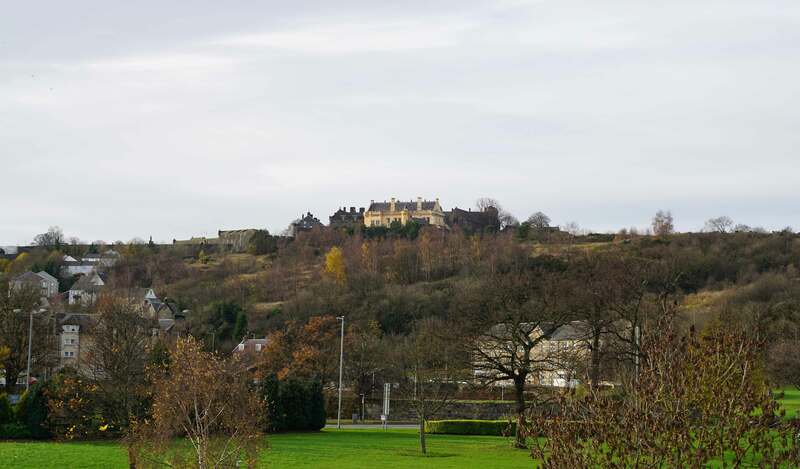 Both armies would have been aware of each other’s presence with the high ground of Stirling Castle and Abbey Craig both offering superb views of the surrounding area. The English force, under Surrey, was undoubtedly the larger of the two armies although the difference in sheer numbers may not have been as significant as some documents claim. Furthermore, the best of the English feudal host was in France with the King. Nevertheless the Earl of Surrey had still mustered a significant force that was certainly better equipped than their opponents plus had a large heavy cavalry element. Surrey’s army also included a significant number of Scots including Malcolm, Earl of Lennox and James Stewart, High Steward. 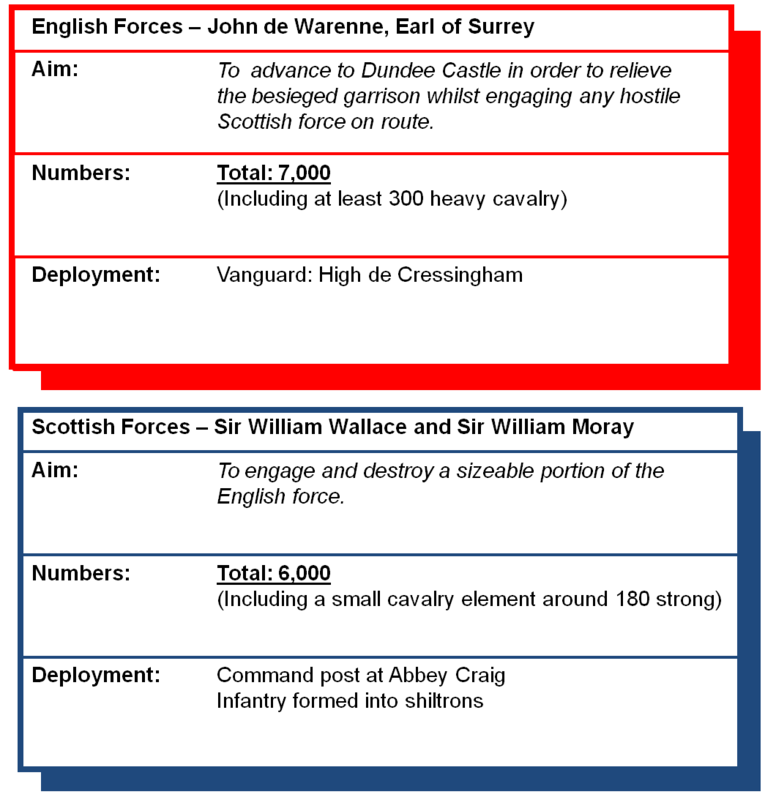 By contrast the Scottish forces were predominantly lightly armed infantry. They were led jointly by Sir William Wallace and Sir Andrew de Moray. 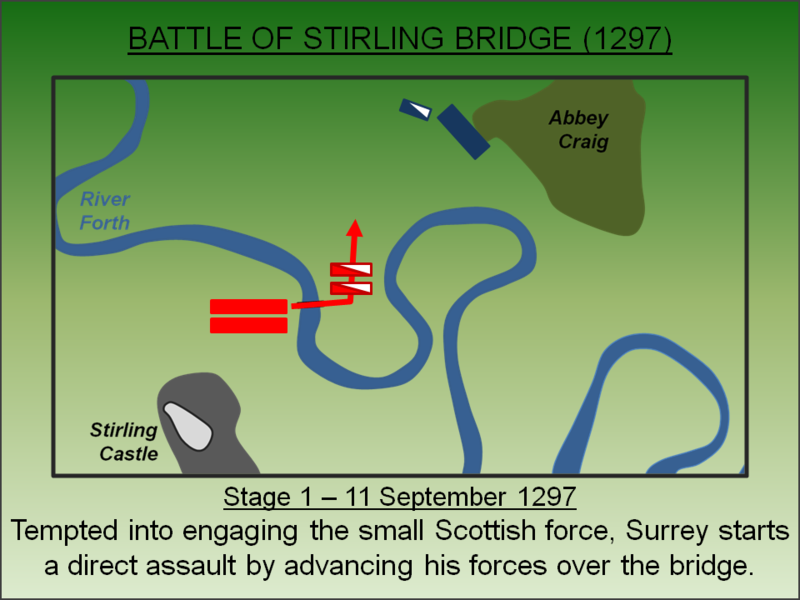 Wallace deployed his forces on the northern side of the river near the high ground of Abbey Craig. With a battle now inevitable Sir Richard Lundie, a Scottish Knight with local experience, suggested a detachment of cavalry be sent to cross the river at the ford several miles upstream. This suggestion was rejected, seemingly on the advice of Hugh de Cressingham, to avoid unnecessary delay. The decision ultimately cost the English the battle. After failed negotiations between the two forces - two Dominican friars were sent to negotiate a Scottish surrender but had been sent packing - Surrey started moving his forces across the bridge. His vanguard consisted of cavalry and mounted men-at-arms both of whom were under the command of Cressingham. However, the bridge was narrow and the troops were only able to move across two abreast. Inevitably the build-up on the eastern shore was slow. Once a significant portion of the English host had crossed the bridge - current opinion suggests around 2,000 men - the Scots advanced in a schiltron formation. This tactic involved a dense body of spearmen in a roughly circular formation that, although very vulnerable to archers, was an effective counter to cavalry and devastating against enemy infantry provided it continued moving forward. With insufficient archers to break the schiltron, and insufficient space to build up sufficient momentum for a high speed charge, the English cavalry was repulsed. The Scots now pushed the English back towards the bridge. Unable to regroup the latter attempted to get back across the bridge but were constrained both by its narrow width and by more soldiers trying to cross. Defeat turned into rout as the trapped English, outnumbered 3 to 1, were slain in large numbers. Some attempted to swim the river but many could not due to their armour. Eventually the Scots captured the eastern end of the bridge although one English knight, Sir Marmaduke Tweng, did manage to fight his way through and back to the main English lines. 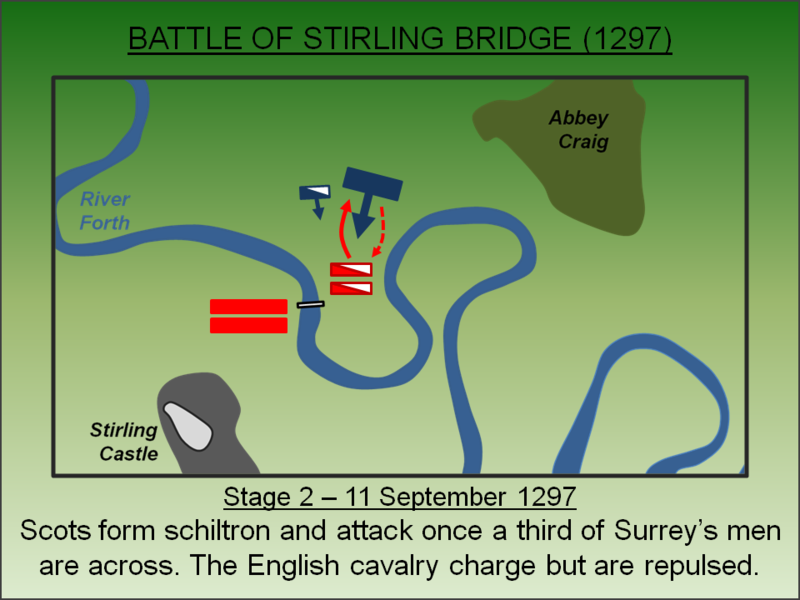 Having seen at least one third of his force decimated by the Scots and facing the probable likelihood they now outnumbered his own forces, Surrey ordered the destruction of Stirling Bridge leaving the English survivors on the far bank to their fate. This included Hugh de Cressingham who was trapped and subsequently killed. The immediate aftermath of the battle saw the English led coalition unravel. Malcolm, Earl of Lennox and James Stewart, High Steward withdrew their troops. Stewart went further than this and launched an attack on the English baggage train hastening their retreat. 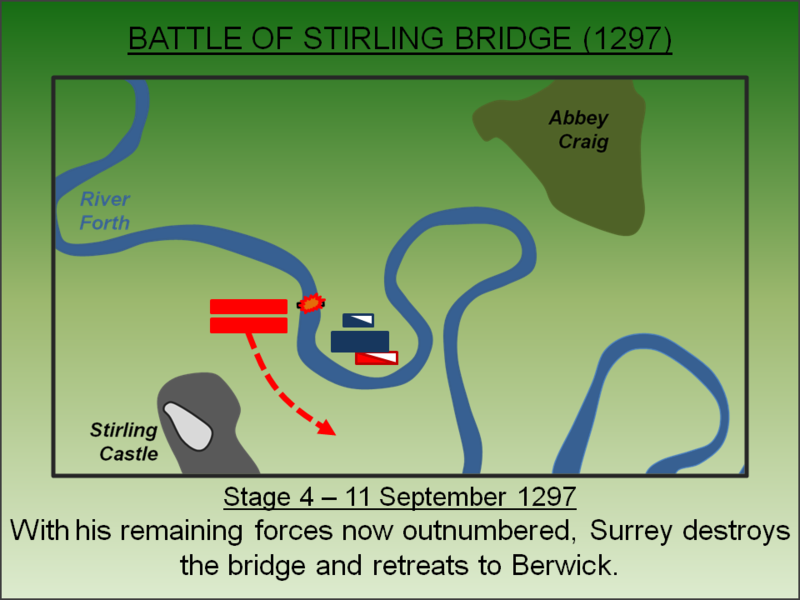 Although they left an English garrison at Stirling Castle, the English forces drew back to Berwick-upon-Tweed leaving a power vacuum in the Scottish lowlands. With Sir Andrew de Moray having been mortally wounded during the fighting, Wallace became the sole leader of the rebellion and was appointed as ‘Guardian of Scotland’ following the battle. His defeat of the English, including their formidable heavy cavalry, was the first significant Scottish victory in the war. Furthermore, Surrey’s retreat back to Berwick-upon-Tweed left the English garrisons across the country isolated and many either surrendered, were starved into submission or were taken by force; the majority of Scotland was now under Wallace’s control. Wallace even mounted an attack on Berwick sacking the town although the castle stood firm. However, it was all just a fleeting achievement – the following year Edward I came north with a new army and defeated Wallace at the first Battle of Falkirk (1298). Battlefields Trust. Battlefields Trust: Battle of Stirling Bridge (1297) Battlefield Report. Lancaster, J.H.D (2016). Stirling Bridge: Battlefield visit notes and observations. CastlesFortsBattles.co.uk. Scant evidence exists at the site of the battle - even the sixteenth century bridge is situated in a (slightly) different position from the medieval crossing. However the topography can be appreciated from either Stirling Castle or the Wallace monument. The latter offers spectacular views over the battlefield and the surrounding area and also has Wallace’s sword on display. Stirling Castle. The castle as seen from the vicinity of the bridge and battle. The English garrison would have had a clear view of the disaster unfolding beneath them. Wallace Monument. 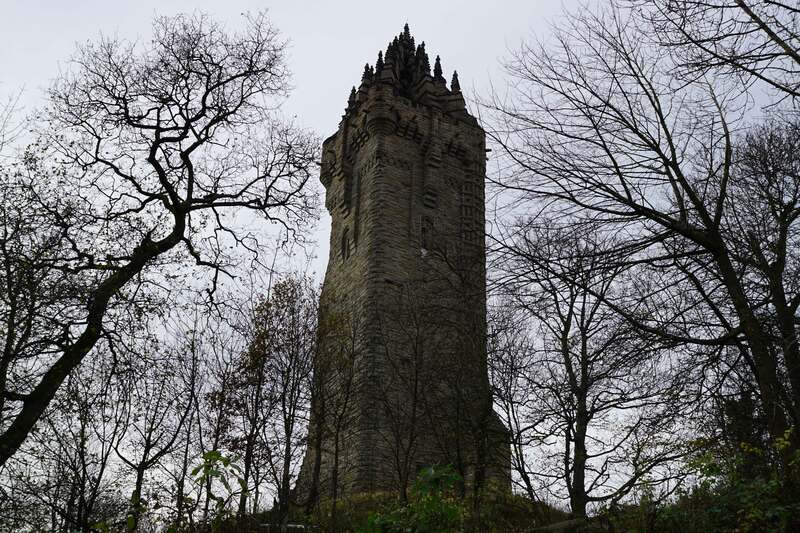 Built in the nineteenth century, the Wallace Monument offers superb views of the battlefield and wider area. The Wallace Sword. 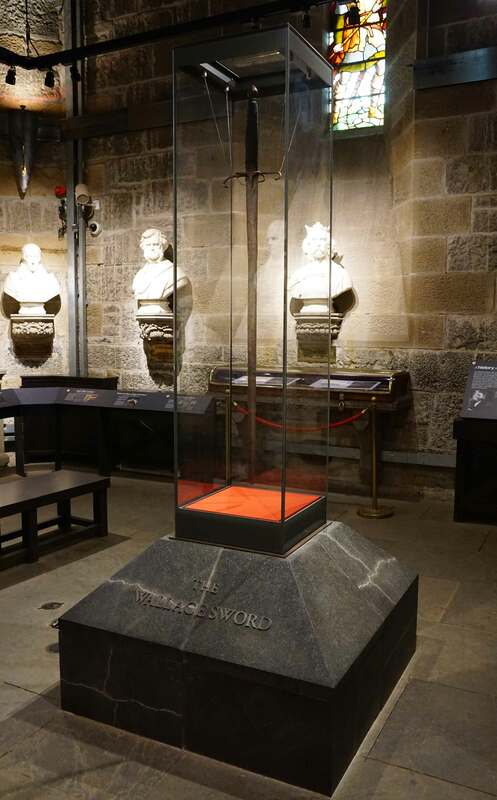 What is alleged to be Sir William Wallace’s sword is on displayed in his monument. The Battlefield. The winding path of the River Forth defined the battlefield. The bridge was located to the centre-right of this picture near the castle. Old Stirling Bridge. Built just a few metres away from the site of the earlier medieval bridge on which the battle was fought, Old Stirling Bridge was constructed in the late fifteenth/early sixteenth century. Wallace Tower. The Wallace Tower was built near where the Scottish initially mustered their forces. The Wallace Monument is a major tourist attraction, is well sign-posted and has a dedicated car park. The bridge itself is not sign-posted but easily found at the address above and has sufficient on-road car parking in the immediately vicinity.